All In-Line Four V MAX SHO® outboards are now available with 25-inch shafts. This brings V MAX SHO performance to multi-species boats, bay boats, pontoons and other 25-inch transom applications. The I-4 V MAX SHO® design maximizes combustion efficiency in a way that no two stroke can, delivering clean, quiet power and performance. The V MAX SHO® 175 and 150 feature Variable Camshaft Timing, which optimizes the angle of the intake camshaft to increase power and throttle response in the low- and mid-RPM ranges. In-line Four V MAX SHO® designs are up to 40% more fuel efficient than traditional carbureted two strokes. 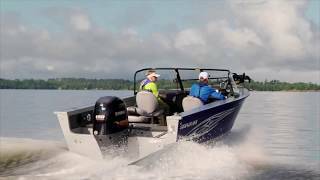 Precision Multi-Point Electronic Fuel Injection and long-track intake system combine to maximize power and fuel efficiency across the line of In-Line Four V MAX SHO® outboards. An array of advanced sensors constantly provide vital atmospheric and engine conditions to the Engine Control Module (ECM), which instantly makes the precise adjustments for optimum performance. The I-4 V MAX SHO® 175 and 150 feature a Cowling Drain System and Air Intake Labyrinth System to trap and drain water that enters their cowlings during normal operation. A four stroke in-line design means there's no need for an external oil tank. That means less weight and more storage room in the boat for tackle and gear. At 50 amps, the V MAX SHO® 175 and 150 alternators boast an 11 percent increase in charging power over the two stroke 150 HPDI®. I-4 V MAX SHO® outboards feature mechanical controls for easy, convenient rigging with most bass, bay and flats boats, and are compatible with analog, 6Y5 digital or Command Link® gauges.